Children are our most important students because they are our future. Our dojo is ideal for developing life skills from tots to teens. Our kids have gone on to become doctors, lawyers, law enforcement professionals and even black belt instructors. Sports are great, but our non-competitive art emphasizes self defense, character development and the protection of others unlike anything else in society today! Tots class teaches ages three to four year olds the basics of the Bujinkan. Tots class is taught by dad and Dai Shihan Jeffrey Prather. Emphasis is on fun and safety. Tots learn fundamental stances falls, flows and rolls. Next comes ninja front, side and backwards walking, running, leaping and climbing techniques. At age three tots start as white belts and earn their yellow stripe by knowing manners of bowing, fundamental stances, falls, and unassisted forward rolls. At age four tots earn their second yellow stripe by learning shoulder, side and back rolls, as well as punches, kicks. Parents are regularly amazed at how much our dojo classes benefit tots and kids via safety, self-esteem, enhanced neurological functions, memory, attention, coordination, physical fitness, and mental alertness. At age five tots transition to kids’ class as yellow belts. Our kids class is the ideal place for children to learn life skills and lessons that will benefit them outside the dojo for years to come! Kids’ Class teaches ages five to twelve year olds self-defense and martial arts. Dad and Shihan Prather leads Kids’ Class. Kids transition through a special system of colored belts. As kids move up through the ranks they learn and earn a wide spectrum of kicks, punches, throws, forms, weapons, manners, escapes, and most importantly priceless, un-quantifiable life skills that no one can give to them, and no one can ever take away. Parents, grandparents, relatives and friends are regularly amazed at regularly amazed at how much their children benefit in safety, self-esteem, enhanced neurological functions, memory, attention, coordination, physical fitness, and mental alertness. At age twelve kids transition to adult class as green belts, often far ahead of new adult students. Many of our students and their parents develop lifelong, extended family relationships. Tots and Kids class are spectator events where parents and guests often burst into spontaneous applause at our amazing kids! Tots are welcome to stay and train the first 30 minutes of all kids’ classes. New tots or kids students can try classes for just $20! Prices are $55 a month for Tots Class, $65.00 a month for Kid' Class. Belts, stripes and certificates are all included free for tots and kids. Bujinkan USA instructors teach kids virtues and values, offer mentorship, parent-sensei conferences and even martial arts movie night and ninja birthday parties! Parents are encouraged to stay and observe their children in class as we consistently provide parents feedback in casual parent-sensei conferences. We are honored to have been helping parents train their children into mannered, moral, mature adults for over two decades. Since our art like jujutsu, does not depend on size, speed or strength it is ideal for kids and great for real life child safety and security. We are family oriented and children centered. Our students and their families become part of our dojo family. And we are there for them in good times and bad. Visitors are always welcome so please come by and watch a kids class today with your child, then try a week of classes for just $20! 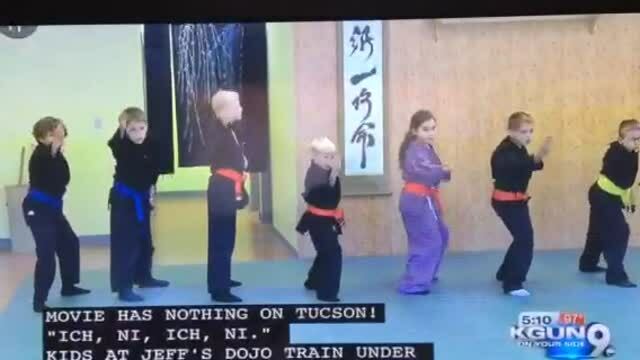 Our kids have often been featured on TV news demonstrating martial arts , self defense and ever anti-kidnap techniques! But most importantly our child students learn values and more importantly earn skills of personal responsibility and self discipline upon which they build their lives! Kids and tots class are tons of fun and always safe. Whether it's a fall on Mt. Lemon or a spill off their bike, our little ninjas roll out safely. And they love our climbing and running wall. Throughout the year we hold special kids events such as origami Christmas ornament making and Ninja Easter egg hunts. Ninja birthday parties are also available. If you'd like a ninja birthday party give us a call!